Fragranced products can certainly make us and the things in our home smell delightful. It’s hard to deny that a freshly bathed baby, warm sheets right out of the dryer and sparkling clean dishes all smell really nice. 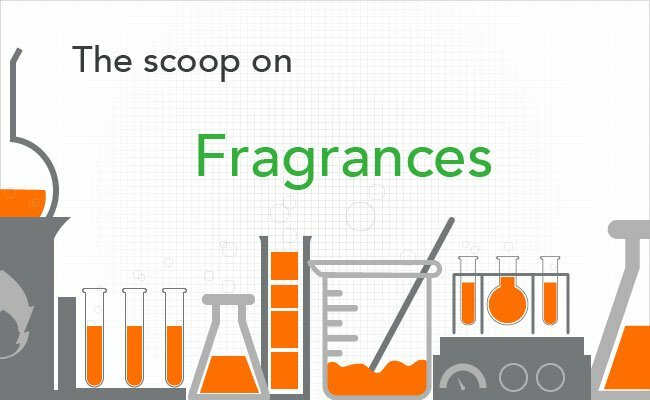 Added scents and fragrances are great for making products seem more effective & healthier. If you’re like most people, you probably assume that fragrances are 100% safe, and that’s exactly what manufacturers want you to think. To arm parents with the information they need to make safe product choices, we’ve compiled what we believe are the top 7 things manufacturers don’t want you to know about fragrance safety. Fragrances are linked to a staggering number of health risks. Across multiple research studies, chemicals used to make fragrances are classified as allergens, hormone disruptors, asthma triggers, neurotoxins & carcinogens. The punchline: fragrances are highly toxic. Fragrances commonly contain phthalates, which are chemicals that help the scents last longer. Health risks for phthalates are startling and include cancer, human reproductive and developmental toxicity, endocrine disruption, birth defects & respiratory problems. These toxic villains are very hard to avoid because manufacturers are not required to list them on ingredient labels. Fragrance chemicals, like other toxic chemicals, can pass from the skin and into the blood. Manufacturers are not required to list their fragrance ingredients on product labels. Often only one word, “fragrance”, is used on the label and can hide a cocktail of more than 100 toxic ingredients. This is because fragrances are considered to be “trade secrets”. The fragrance industry regulates itself, so that safety testing does not have to be confirmed by regulators before products are sold to consumers. So called “natural fragrances” can be just as toxic as synthetic fragrances. Whether it’s in a cleaning product, deodorant, shampoo, or laundry detergent, fragrance chemicals aren’t actually making your product perform better – they are just giving you that perception. We’ve been trained to think that clean has a smell, when in truth that’s not the case. Don’t be fooled by products labeled with “natural fragrance,” because there is no standard criteria for what these words mean. These can be just as un-safe as fragrances not described this way, so skip these products too. If you see the words “fragrance-free” or “unscented”, your Spidey senses should kick into action. You also have to check the ingredient list, because sometimes manufacturers use masking fragrances to cover the chemical smell of their products. For more tips on how to avoid toxic chemicals in the products you commonly buy, check out these toxic chemical free product guides as well as this toxic chemical glossary of the top toxic villains to avoid across all types of products. Cleaning products are some of the most notorious when it comes to toxic fragrances, so jumpstart your switch to toxin-free cleaners by checking out Force of Nature. It has zero fragrances, dyes, preservatives, allergens or irritants, yet cleans just as effectively as bleach.